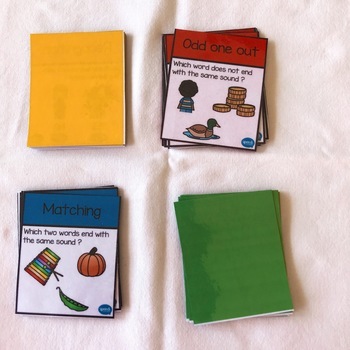 Our phonemic awareness series of games target skills while having fun. 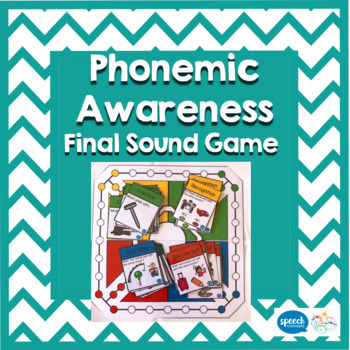 Phonological awareness is the ability to become aware of the phonological base of our language by being able to separate the sounds or phonemes in words and to manipulate them. 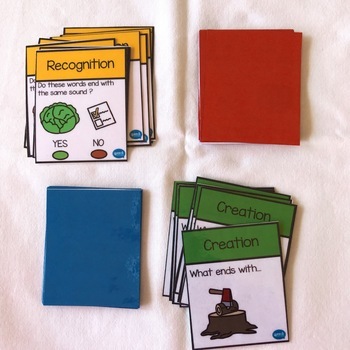 This game focuses on developing awareness of the final sounds in words. The resources contain 180 cards in four groups. Present two words asking the student if they end with the same sound or not. Cards are presented with a yes/no panel. The cards present three words, two of which finish with the same sound and one that doesn’t. The student is to identify which word doesn’t end with the same sound. Similar but different to Step 2. Find the two words that do end with the same sound from the selection of three. At the top of the hierarchy is word production. At this level the student is able to spontaneously produce words which end with the same sound. Using a dice move around the board. When you land on a square, take a card. Depending on the level you are working on you can use a single colour for all or mix them up for a card of chance. 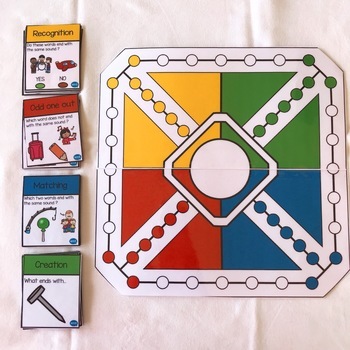 The aim of the game is to move all five counters around the board and home again.